I envision a day when all browsers will render code the same way. The day before that day, Google will publish it’s Page Rank algorithm to the world. In the meantime, I’ve learned of this nifty little Firefox browser plug-in that lets you view a website as if you’re using Internet Explorer (without actually having to use Internet Explorer!). This nifty little plug-in is called IE Tab. As all web designers know, checking your site in multiple browsers to make sure it displays correctly is important. IE Tab allows you to toggle between a Firefox view and an IE view of your web page with one click of the mouse. In the bottom right corner, you will see the Firefox logo; click on it, and your page will reload as it would look in IE. Click the Firefox icon in the lower right corner of your web browser to switch to an IE view. Click the IE logo to switch back to the Firefox view. Now there’s no excuse for not checking your web page design in at least two browsers. Some sites just don’t work well in Firefox. Coincidentally, most of them happen to be Microsoft sites. Take Outlook Web Access (OWA), for example. You can use OWA in Firefox, but you’re really missing out on a lot of the functionality it provides when used in IE. You could manually toggle between the Firefox and IE view each time you open OWA, but IE Tab doesn’t want you to work that hard (and why should you, really?). That’s it! If you reload the page, it will automatically open in IE view (you should see an IE logo in the lower right corner of your browser window after doing this). If your library (like Towson) is using SharePoint, this is a must. It’s impossible to use SharePoint effectively in Firefox (without the IE Tab plug-in, of course!). You can’t collaborate on documents, and you’ll be missing the WYSIWYG editor when you try to edit a wiki page or reply to a discussion thread. 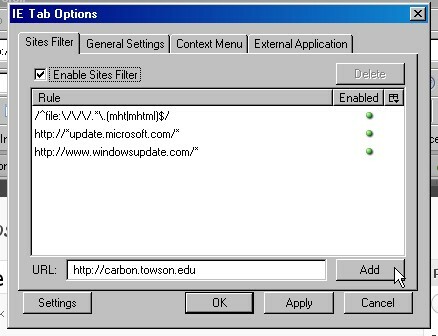 IE Tab makes everything ok. Our SharePoint implementation is located at http://carbon.towson.edu, so I simply navigate to that URL, right click on the Firefox logo, click Add, and then click OK. Any web page I open within the carbon.towson.edu domain will automatically open as an IE page. With IE Tab, there’s no excuse not to be using Firefox as your main browser. Firefox has an open development community, meaning there are lots of great browser plug-ins to take advantage of (IE has a few as well). Take a look through the list and leave recommendations for other plug-ins you like in the comments section. There are a few other plug-ins similar to IE Tab, so you may want to test the market before you choose one. Many people keep (with varying degrees of success) a to do list in one form or another. I for one am always making lists on little pieces of paper (often old card catalog cards) and then losing them in the bottom of my tote. Even worse…I have a friend who procrastinates by recopying lists instead of tackling the tasks they outline. The folks at MIT have kindly developed a tool to help us manage our lists. List.it is a Firefox (version 3 or above) plugin for electronically creating, managing, and backing-up your list. After downloading the plugin, a small yellow icon will appear in the bottom-right corner of your browser window. Right clicking the icon allows you to quickly type in a new list item. Left clicking the icon opens your list as a narrow window as a sidebar to your browser window. With the sidebar open you can added list items, edit items, move items up/down in your list, search your list, and best of all – delete items as you finish them. In addition to the regular search box, List.it allows you to create custom quick search buttons. For example, you could start all task related items with the words “to do” and then create a “to do” search button to quickly retrieve entries that include these words. Other advanced features are customizable hot keys and synchronized back-up capabilities. Under the Options tab you can set hot keys for opening/closing the sidebar, bringing up a search box, and quickly opening an input box. To have your list backed-up on List.it’s secure server, you will need to register your email address with them and create a password. After playing with this tool for just a few hours, I would say it is intuitive, convenient, and helpful. I’m going to use it to keep track of all the books I would like to order, but can’t afford. Each new item could include a link to an online book review and a department code, such as bookWMST. Then once my budget is something above zero, I can search for bookWMST and retrieve my list of ideas. Ah…that will be a great day. Bookmarks are out, breadcrumbs are in. Doted as the web’s version of DVR, iBreadCrumbs is a browser plugin/toolbar for Firefox that keeps track of the websites you visit as you browse. But don’t worry, it’s not Big Brother; you control when it records and when it does not through the convenient browser toolbar. iBreadCrumbs automatically saves the sites you visit during an iBreadCrumbs session. While you search, you can add annotations for a particular site and give extra-cool sites the “thumbs-up”. When you finish your session, click the “Stop” button. Now, you can name the group of sites you have just recorded, add a description, and categorize it; or, add it to an existing group. The real power of iBreadCrumbs is the ability to share what you find in numerous ways. BreadCrumbs can be shared with members of an iBreadCrumbs group, exported as an Excel file, sent via email, or translated into HTML for easy web page creation. Add “quickly and easily” to the beginning of these and you get the idea. Another potential use is given on the Information Literacy Technologies blog: “have students install and then track, annotate/reflect and share the path they took to finding resources on a topic”. Then just click the “Start” button on the toolbar and never get lost in your internet searching again! YouTube – iBreadCrumbs.com Introduction Video Checkout this video to learn more about how iBreadCrumbs works. Wired Campus: iBreadCrumbs: a Social Network for Research Sharing -… The Chronicle of Higher Education’s article about iBreadCrumbs. iBreadcrumbs « Information Literacy Technologies A great idea for using iBreadCrumbs for information literacy instruction. iBreadCrumbs: “The First way to Save and Share Online Research” « CMJN… A nice blog entry about the features of and uses for iBreadCrumbs. Open Access Journals in Mathematics A BreadCrumb I created and then exported as HTML in order to create a web page listing open access journals in mathematics.